This upscale Caribbean paradise Penthouse sits on the top floor and overlooks the breathtaking views of the majestic blue Caribbean Sea. Lounge in the sunshine at one of the pools or take a walk down to the white sandy beaches, explore the shopping and dining in the village and relax as the sun goes down at this beautiful property. - Stocked kitchen with all new appliances, granite countertop, and breakfast bar. The apartment is located in the newly remodeled Villas Marlin Condominium. The complex features 3 beautiful pools (including a kid's pool), palapas, spas, mini market, travel agency, laundry service, tennis court, and 24 hours manned security with gated controlled entry. 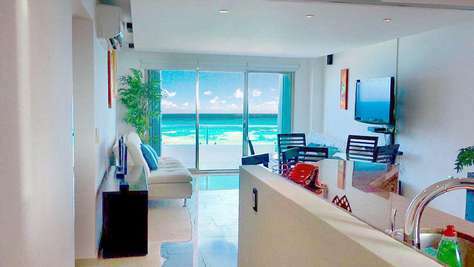 - It is across the street from Kukulcan Plaza, home to the brand new Soriana grocery Supermarket Location which is few steps away from your beachfront home so that you can eat fresh food everyday. - We are 5 minutes from the beautiful Tuscan style Plaza La Isla. You'll have everything you need, within a 1 mile. - Stocked kitchen with all new appliances, granite counter top, and breakfast bar.